As animal trainers, one of the most important things we do is build and nurture the relationships that we share with our animals. A great way to do this is through play! Not only does play allow us to build relationships, but it's also a great way to find out what our animals seem to enjoy or find reinforcing. One of the things our resident California sea lions seem to enjoy the most is any type of water play. Watch the video below to get a behind-the-scenes peek at Zoe and Sierra as they enjoy playtime with a sprinkler that was set up for them by their trainers! 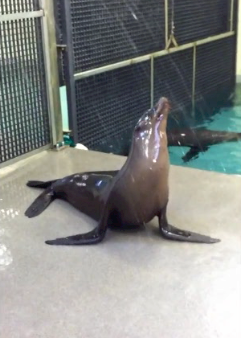 This isn't the first time we've featured the sea lions enjoying some fun under the spray. Watch the sea lions hosing off and having summertime fun in the water, too! There's No Fun, Like Snow Fun!